People make beverages out of nearly anything. Spruce beer is one proof of it. spruce needles to French explorer Jacques Cartier in the 1500s to cure sailors who were sick with scurvy. By the 1700s, spruce tea was known to sailors on the West Coast and in Oceania for the same purpose. Meanwhile, East Coast settlers had advanced to brewing beer from hops, molasses and spruce tips and branches. Eventually, the flavor was adapted as a soft drink. How much vitamin C does a spruce beverage contain? Not much, according to modern researchers. In fact, if a sailor depended only on spruce beverages to reverse scurvy, he’d have to drink enough to float a navy. 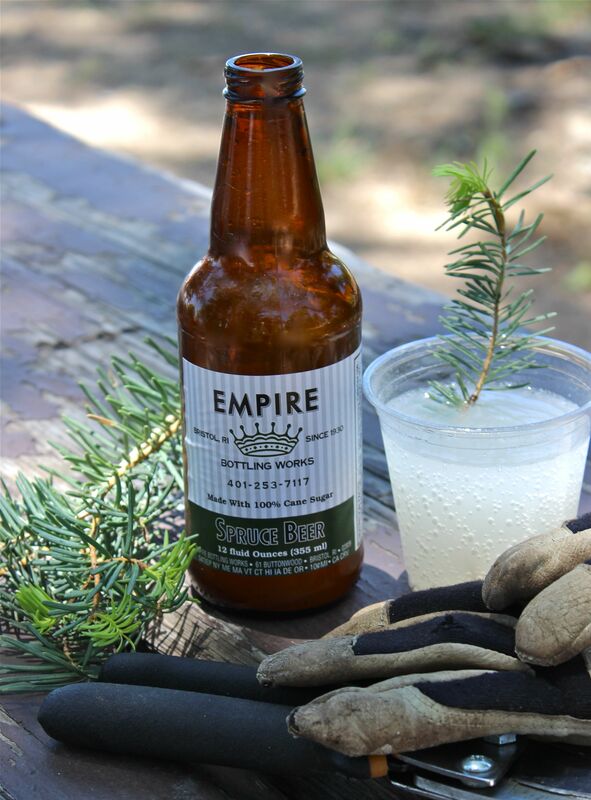 It’s not easy to find spruce beer soda, but lucky us – Empire Bottling Works in Bristol, R.I., still makes it. Empire, established in 1930, is so small that it doesn’t have a website and it prints its address and phone number on its labels. What’s in it: Artesian spring water, cane sugar, “extract flavor” (presumably of spruce), citric acid, sodium benzoate. Appearance: Yellowish, milky, opaque with carbonation bubbles rising out of the murk. Aroma: Sweet and spruce-y, reminiscent of the day we all sanded our wood projects in junior high shop class. Or of turpentine. Flavor: At first taste, sweet and strong. At second taste, sweet and bitter. After that, deadly. Finish: Regrettably long and bitter. Pairings: Garlicky beef jerky. Anything to mask the flavor. Notes: It’s exciting to twist off the top and catch a whiff of Christmas tree in a bottle. The bottle is where this spruce beer should stay. I’m pretty sure this stuff gave me beaver breath. I’m definitely sure that half a bottle gave me a stomachache. This is definitely an acquired taste, and I’m curious how long it takes to acquire it – though not curious enough to try. If you’re a spruce beer fan, could you please clue me in on how to appreciate this one?